Hex Signs is the unofficial name of this pattern. The Hex Signs pattern was printed on the Oval Casseroles as a regular production item, as well as on the 473 and 475 Cinderella Casseroles. “Deluxe fashion’s new look!” At $9.95 the Deluxe Cinderella Casserole came with a serving cradle with dual candle-warmer. 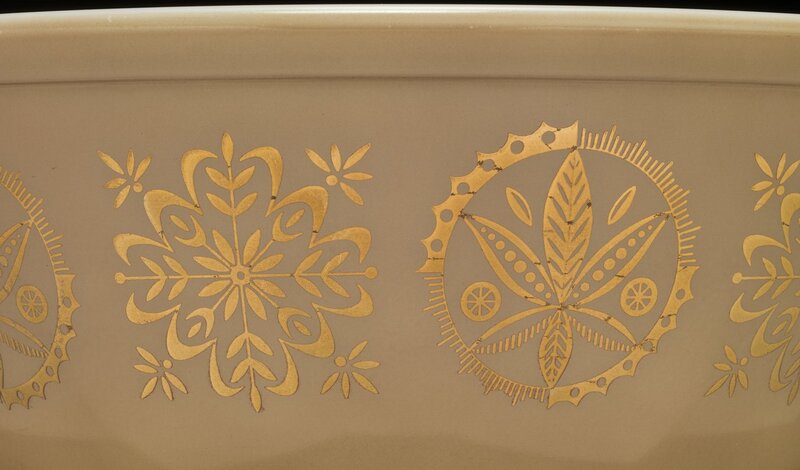 The gold pattern of leaves encased in a circle alternating with a square flower motif is printed on the white 2 ½ quart (045) Oval Casserole. Unofficially known as “Hex Signs,” this pattern is also printed on a tan 404 bowl that comes with the clear lid normally associated with the 026 casserole dish. Also in existence are the 473 and 475 Cinderella Casseroles with the Hex Signs design in gold on white as well as a turquoise Hex Signs design on a white 475 Cinderella Casserole. The 475 Casseroles were paired with a clear patterned lids in gold and turquoise to match their respective design color.